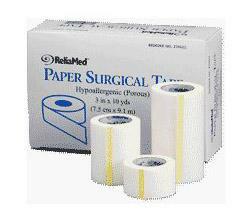 White, hypoallergenic paper tape for general use. Easy to tear, with a natural porosity that allows skin to breathe. Ideal for ostomy patients and situations involving frequent retaping. Latex-free, 1" x 10 yd roll.